There probably won’t be many bright spots for the Orioles this year. Coming off of an awful 47-115 campaign in 2018, there’s certainly a lot of room for improvement to say the least, but even still, Baltimore is projected to be the worst team in baseball yet again. They did, however, open their season by taking two of three games against the Yankees, who project to be the best team in the majors. So perhaps we already have found bright spot No. 1. Nonetheless, the Orioles employed the opener on Saturday, pitching Nathan Karns for two innings before turning to Jimmy Yacabonis as their first arm out of the bullpen. Karns was solid, limiting the Yankees to just one hit (though he did walk three) and no runs. Yacabonis, too, pitched well; he only allowed one run in his three innings of work. In the third, Yacabonis recorded both of his strikeouts on the day. The victims were Aaron Judge and Luke Voit. That was Yacabonis’ specialty, and it’s easy to see why. At first glance, the pitch looks like it’s headed right for the middle of the strike zone. Then it darts in towards Voit, and he swings through it. Don’t be fully enveloped by just the movement of the pitch. It also came in at a not-easy-to-hit velocity of 95 mph. Depending on the site, Yacabonis’ pitch is either classified as a two-seam fastball or a sinker, though, as David Laurila wrote in 2017, most pitchers view the two different classifications as the same exact pitch. The grip used is in fact the same for both, and the only distinguishable difference is a pitcher’s hand position and finish. No wonder then that PITCHf/x and Statcast may have a tough time differentiating between a two-seam fastball and a sinker. Since we use PITCHf/x data on our player pages at FanGraphs and PITCHf/x classifies Yacabonis’ pitch as a fastball, I will refer to it in that way. Regardless, as you can tell in the GIF above, Yacabonis’ two-seam fastball has a lot of horizontal movement towards right-handed hitters like Voit. Last season, Yacabonis’ fastball moved 9.6 inches towards righties, the third-most horizontal movement in that direction of any pitcher in baseball. Likewise, in 2019, Yacabonis has already generated 9.0 inches of horizontal movement towards righties, good for sixth-most. Generating good movement on one’s pitch is all good and well, but what does that actually mean in terms of results? One may surmise that a fastball that runs in on right-handed hitters would do one of two things: generate a lot of ground balls and/or generate a lot of swings-and-misses, like we saw with Voit. Two-seam fastballs already generate more ground balls than the league average (53.0% ground-ball rate on two-seamers versus 43.2% overall), but for Yacabonis, they haven’t been there quite yet. To date, he only has a career 48.2% ground-ball rate on his two-seam fastball; in 2018, the league-average mark on two-seamers was 53.0%. In 2019, six of Yacabonis’ eight batted balls off of his fastball have resulted in ground balls, good for a 62.5% rate, but it is far too early to draw any conclusions from that. As you can see, there’s no real correlation between fastball movement towards right-handed hitters and ground-ball rate. Yacabonis represents the yellow dot. Clearly, his fastball does produce more ground balls than the league average (48.1% versus 42.8%), but that is probably due just to the nature of a two-seam fastball and not due to any special skill that Yacabonis, and only Yacabonis, has. Regardless, it doesn’t look like there’s any untapped potential here. The other hypothesis that I suggested was that Yacabonis should be generating more swinging strikes with his fastball than normal. After all, Voit looked pretty silly in the above GIF. However, like with ground-ball rate, Yacabonis’ numbers just aren’t there. 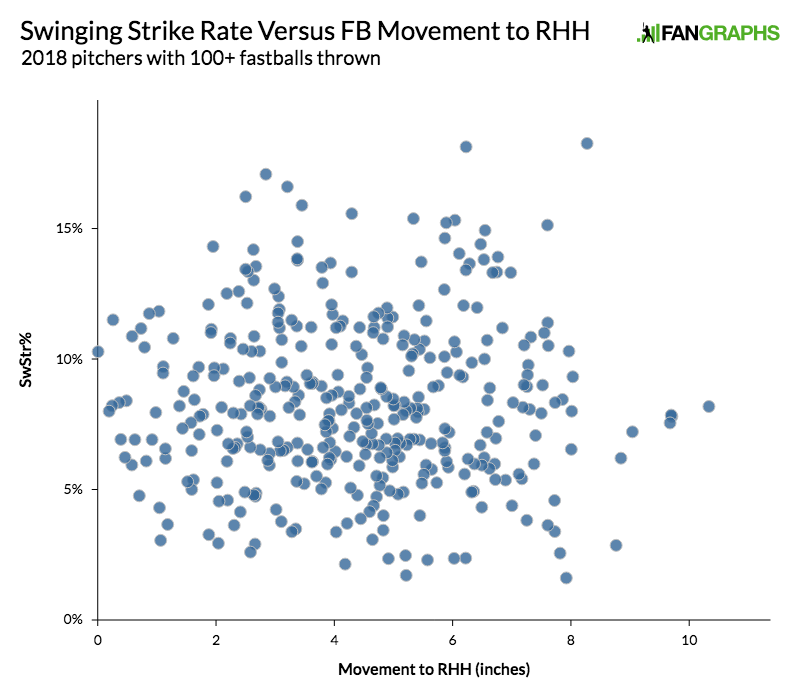 The league-average two-seam fastball generated a 14.0% swinging strike rate in 2018; Yacabonis’ fastball was swung-and-missed at just 7.8% of the time. Again, there’s no real correlation, which, at least to me, is a bit of a surprise. I would have thought that hitters would be far more likely to swing and miss at a fastball with more movement, but there’s no real indication of that happening. To me, this is fascinating. 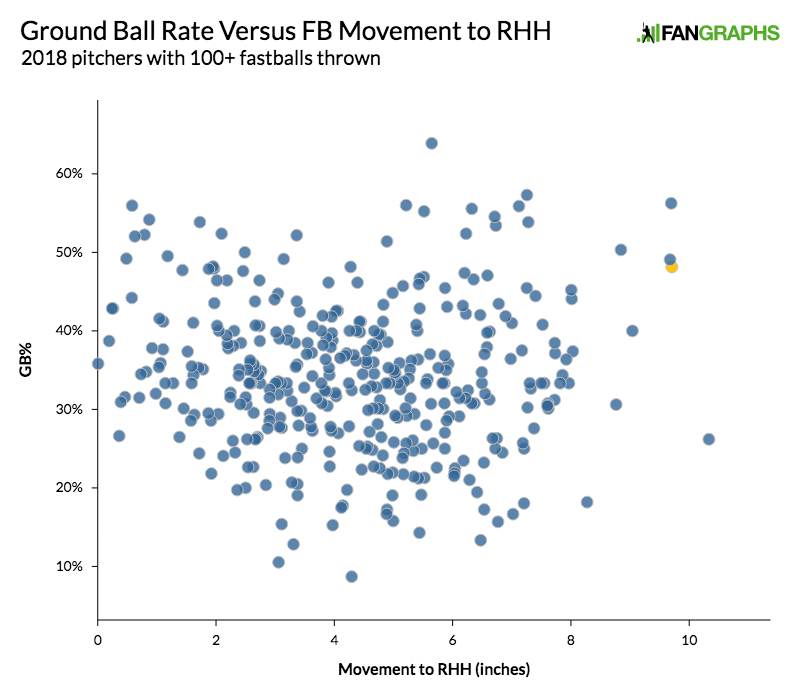 Before doing this research, I would have definitely guessed that horizontal movement correlated, at least weakly, to either ground-ball rate or swinging strike rate, if not both. But, the data is the data, and it tells us otherwise. What does this mean for Yacabonis, then? 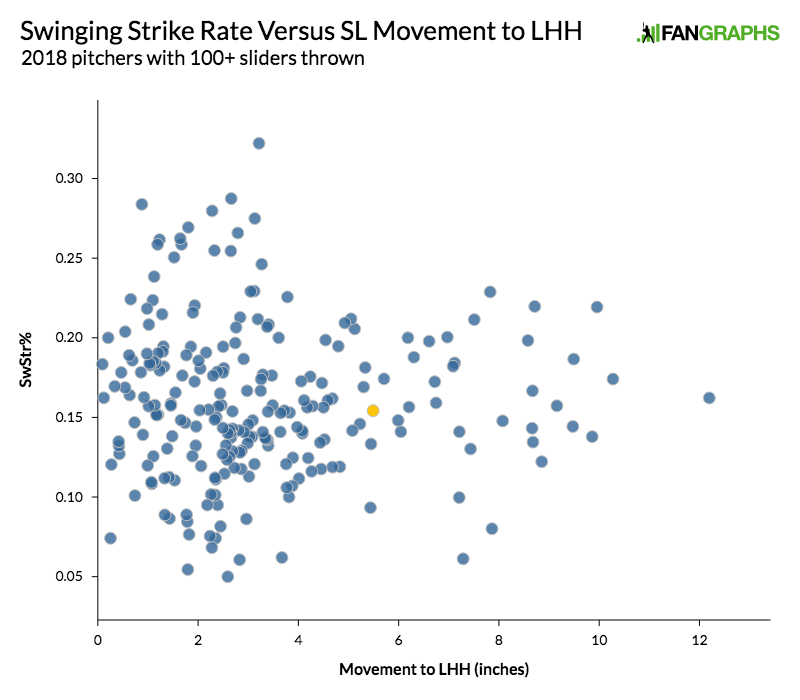 It might mean that, while he has some nasty stuff, the excellent movement on his pitches alone might not necessarily translate into on-field success. To further this idea, I identified four pitchers who could be considered rough comparisons for Yacabonis, based mostly upon their fastball and slider horizontal movement: Miguel Castro (who, for what it’s worth, also pitches for the Orioles), Chargois, Diego Castillo, and Joe Smith. None of these four pitchers had particularly successful 2018 seasons. Castillo pitched the best, posting 1.1 WAR in 56.2 innings, but some of this could be due to his average fastball velocity of 98.0 mph, well above Yacabonis’ 93.8 mark. Castro seems to be the most similar pitcher to Yacabonis. He possesses an average fastball with velocities right around Yacabonis’, and both posted similar marks on their horizontal movements. Castro’s batted-ball data appears to be nearly perfectly in line with Yacabonis. 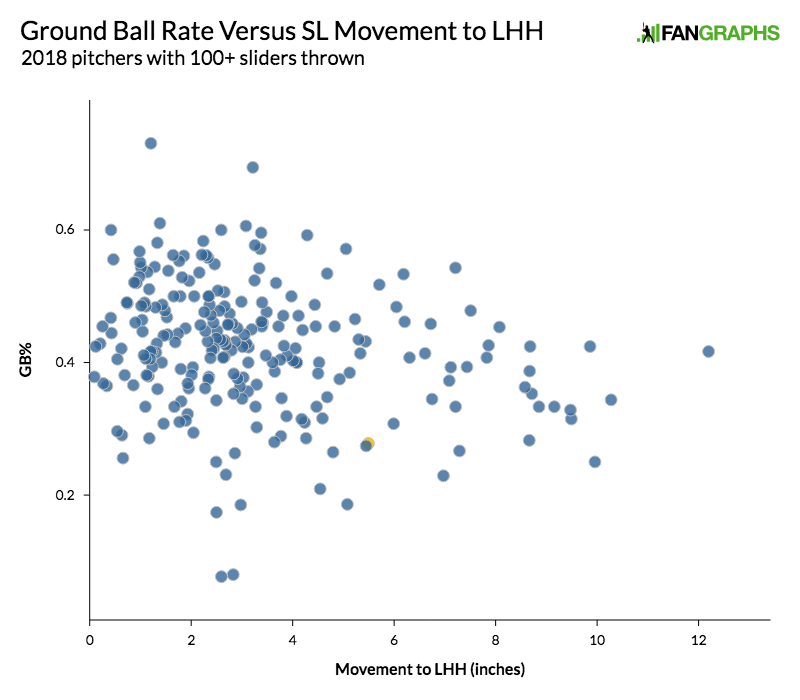 His fastball ground-ball rate was just one percentage point higher, his fastball swinging strike rate was less than a percentage point lower, and his slider swinging strike rate was three points lower. The only noticeable difference was in their slider ground-ball rates, a mark in which Yacabonis greatly differed from all of the other similar pitchers. So, outside of a potential increase in slider ground-ball rate, there might not be a whole lot of room for growth in Yacabonis’ results. While Yacabonis’ pitch that fooled Voit certainly looked nasty, there’s no real evidence to suggest that he might be able turn this extreme horizontal movement into any tangible success. And, in his first 63.2 innings in the major leagues, Yacabonis (4.95 ERA, -0.2 WAR) has supported this theory himself. We hoped you liked reading Jimmy Yacabonis’ Excellent Movement Doesn’t Mean He’s Due for a Breakout by Devan Fink! Great article. Regarding your swinging strike rate vs fastball movement graphic, is there a way to control for velocity? I wonder if there are some slower fastballs in there that are hiding the trend. My thought would be that on a 88-90mph fastball the hitter would have time to adjust to the movement, whereas if it’s 93+ and moves they end up missing.